Location: The summer school will take place at the Technische Universität Berlin. Registration Deadline: July 15, 2018. The registration is free of charge. The intention of the summer school is to provide an introduction to an energy based modeling approach that allows to deal with coupled systems from different physical domains that act on widely different scales. Each physical system is modeled via a model hierarchy (ranging from detailed models for simulation to reduced models for control and optimization) of port-Hamiltonian systems. The systems are coupled via a network of uni-physics nodes coupled via power conserving interconnections so that the full system stays port-Hamiltonian. Using this very flexible approach, it is possible to control the accuracy of each component seperately and to the need of the application. Error controlled model reduction and Galerkin projection as in Finite Element Modeling work in an analogous way. As real world test cases models from gas transport optimization, power grid modeling, or acoustic field simulation are discussed. The lectures of the summer school will be given by Prof. Dr. Volker Mehrmann (Technische Universität Berlin), a distinguished expert in the topic of the summer school that will provide theoretical and practical aspects of hierarchical energy based modeling. The participants will apply their knowledge in complementary exercises. 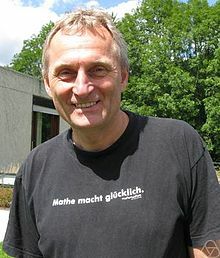 Prof. Dr. Volker Mehrmann is a full professor at the institute for Mathematics of the Technical University Berlin in Germany. His research activies include but are not limited to differential-algebraic equations, model reduction, numerical linear algebra, adaptive finite element methods, optimal control, error analysis and stability analysis. He is (co-)author of several books and has (co-)authored more than 200 journal publications. The course will conclude with oral exams or a written test depending on the number of participants. Participants will be issued a certificate from the Technical University of Berlin. The course will consist of 20 lectures (each 45 min) plus 8 exercise sessions (each 45 min) including practical sessions using MATLAB. Groups of up to 3 people perform the exercises. There will be an excursion on Wednesday afternoon followed by a joint dinner (the participation is optional). The costs for the excursion and the dinner are not included and will be collected during the summer school. The exams will take place on Friday afternoon. Taking the exam is optional. Registration is open until July 15, 2018. The registration is free of charge. The summer school will take place at Technische Universität Berlin, Straße des 17. Juli 136, 10623 Berlin, Germany. The lecture rooms are located in the Math Buidling (MA). Travel information how to get to the TU Berlin can be found here. Berlin offers a large variety of possible accommodations. The following list provides only a short selection. Prices are approximate and not guaranteed. Please make your own reservation sufficiently early because hotels in the university area fill up really fast.